Manufacturer of a wide range of products which include cartridge pencil heater, high density cartridge heater, pouch packaging machine heater, pencil cartridge heater, ceramic band heater and tubular heater. We design quality Mica Band Heater which is used for heating gases and liquids in pressurized vessels and tanks. Flange Heater is one of the most widely used methods for heating liquids (such as water, oil, heat transfer fluid and corrosive solutions). It is integrated with flange, which is welded to tank wall in this heater. This heater is also called hairpin-bent tubular element which is brazed or welded into the flange. In case of Circulating Type Heaters, the flange is welded to a pipe. This type of Immersion Heater is acknowledged for its optimal performance in the heating of gases & liquids and generation of steam in the tanks and pressure vessels. There is a variety of sizes and electrical enclosures available for this Flange Heater. 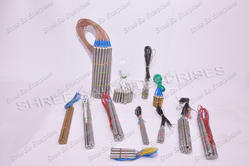 We are a prominent manufacturer, supplier and exporter of highly efficient, high temperature Cartridge Heater. These are manufactured using a nickel-chrome resistance wire which is swiftly wound around a Magnesium Oxide core to construct a cartridge heater. It is fitted into a stainless or Incoloy tube, placing the resistance wire close to the sheath. Inside the tube, the Magnesium Oxide core is centrally placed and the magnesium oxide powder filled on it. Nickel pins are passed through the middle of the core making touch with the resistance wire on both the sides. The external sheath gets an excellent heat transfer with the aid of a swaging operation. The heater is closed from one side with a welded metal end-disc and wire leads exit at the other side which is typically closed with a lava seal. The options of a variety of wire leads and lead protection are acquirable. Heaters Cartridge can be catered with internal thermocouples, mounting fittings and many other options. 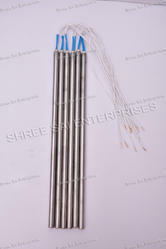 We are a prominent manufacturer, supplier and exporter of highly efficient, high temperature Cartridge Heater. These are manufactured using a nickel-chrome resistance wire which is swiftly wound around a Magnesium Oxide core to construct a cartridge heater. 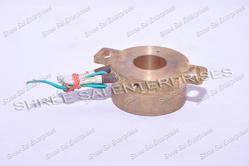 Cartridge Heater can be catered with internal thermocouples, mounting fittings and many other options. We are a prominent manufacturer, supplier and exporter of highly efficient, high-temperature Pouch Packaging Machine Heater. These are manufactured using a nickel-chrome resistance wire which is swiftly wound around a Magnesium Oxide core to construct a cartridge heater. Heaters Cartridge can be catered with internal thermocouples, mounting fittings and many other options. 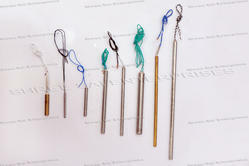 We are a prominent manufacturer, supplier and exporter of highly efficient, high-temperature Pencil Cartridge Heater. These are manufactured using a nickel-chrome resistance wire which is swiftly wound around a Magnesium Oxide core to construct a cartridge heater. It is fitted with a stainless or Incoloy tube, placing the resistance wire close to the sheath. Inside the tube, the Magnesium Oxide core is centrally placed and the magnesium oxide powder filled with it. Nickel pins are passed through the middle of the core making touch with the resistance wire on both the sides. The external sheath gets an excellent heat transfer with the aid of a swaging operation. The heater is closed from one side with a welded metal end-disc and wire leads exit at the other side which is typically closed with a lava seal. 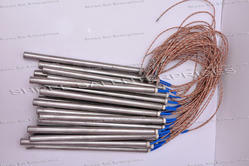 The options for a variety of wire leads and lead protection are acquirable. Heaters Cartridge can be catered with internal thermocouples, mounting fittings and many other options. Longer heater life, high processing temperature capabilities and full flexibility for ease of installation characterize Ceramic Band Heater. They are space heaters that generate heat by passing electricity through heating wires embedded in ceramic plates. There is implicit thermal insulation to curb heat losses and for the conservation of electrical energy. It is used in Blown Film Dies, Food and Candy Extruders, Drum Heating etc. A wound nickel chrome resistance wire is strung through high-temperature ceramic bricks that sit on an insulation blanket of ceramic fiber insulation. It helps reducing heat losses by around 20% from un-insulated Ceramic Heater. Mounted on stainless steel casing with serrated edges, it provides strength and great flexibility such that the heater can be fully opened for the security of installation. Heat is transmitted through conduction and radiation in Ceramic Band Heater. It can be customized in terms of sizes, clamping styles and multiple segments. Specially designed using rust resistant steel sheath casing, Tubular Heater provide the best combination of high emissivity, physical strength and good thermal conductivity to heat cylindrical parts. Specially selected grade and thickness of mica sheet is used inside it to isolate the windings which is made of nickel chrome resistance ribbon wire to acquire the lowest internal element temperature possible. It results in long lasting heater life. The ribbon wire is wound evenly spaced on a preferred mica strip to provide even heat distribution and to eliminate hot spotting that can lead to unanticipated heater failure. Here, a low thermal expansion alloy sheath is used for the outer sheath covering the entire width of the Band Heater. Tubular Heater are installed by careful hammering on the heaters along with square section grove over the Manifold and pressed to hold the Heaters in position and to get good surface contact, which results in good thermal exchange and increases the heater life and reduces energy loss. Tubular Heater are made with quality raw material like Tubes, MGO powder, Resistance wire, Terminal pins and etc. Heater Tubular offered by VKE are energy efficient.